"Mega-City One, 2134 AD. This urban hell on the east coast of post-apocalyptic North America is home to 50 million citizens. Overcrowding and unemployment are endemic, and crime is rampant. Only the Judges can stop utter anarchy. Empowered to dispense summary justice, these lawmen are judge, jury and executioner. Toughest of all is Judge Dredd - he is the Law!" One-shot, with art by Ben Willsher, colours by Gary Caldwell and letters by Annie Parkhouse, in Judge Dredd Megazine #342, Nov 2013. 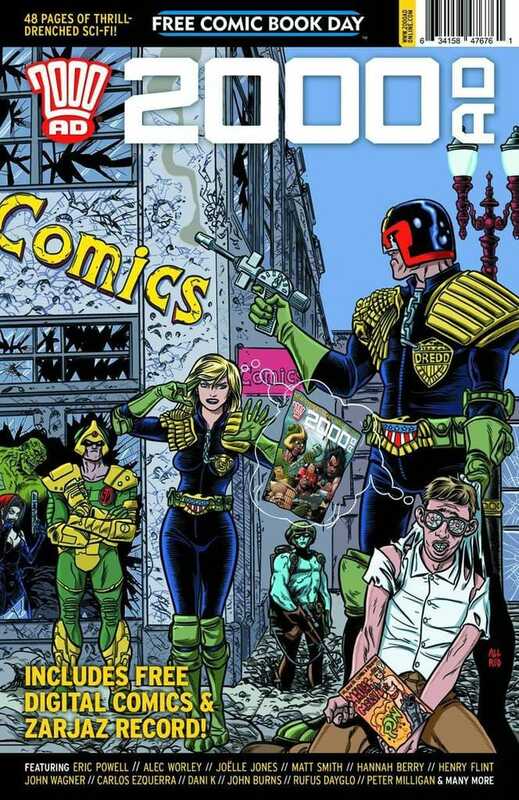 Dredd teams up with a Justice Department sniper to hunt down a Judge-killer at large in Mega-City One. One-shot, with art by Ben Willsher, colours by Chris Blythe and letters by Annie Parkhouse, in 2000 AD #1910, December 2014. A masked revolutionary is terrorising the rich and powerful of Mega-City One, exposing their darkest secrets to the public. 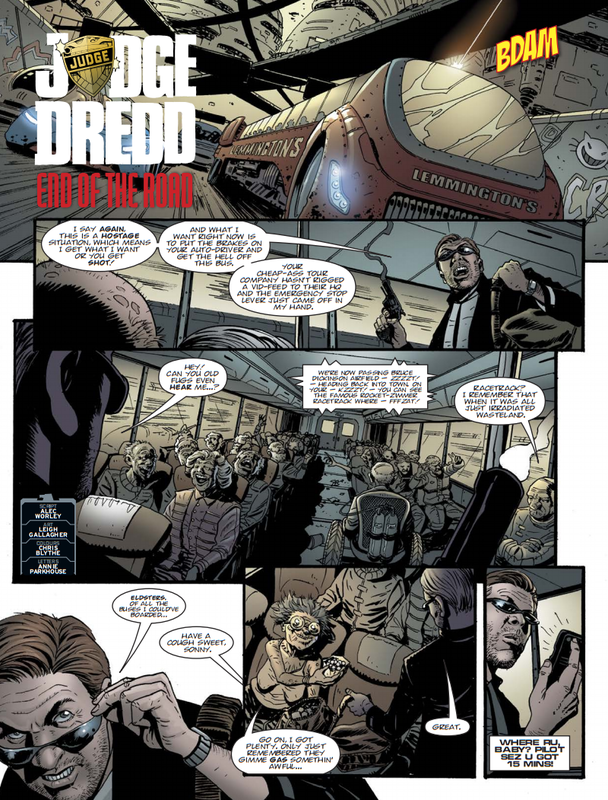 Dredd is assigned to protect the lunatic's latest target: controversial comic-book artist Kurt Vymarr. 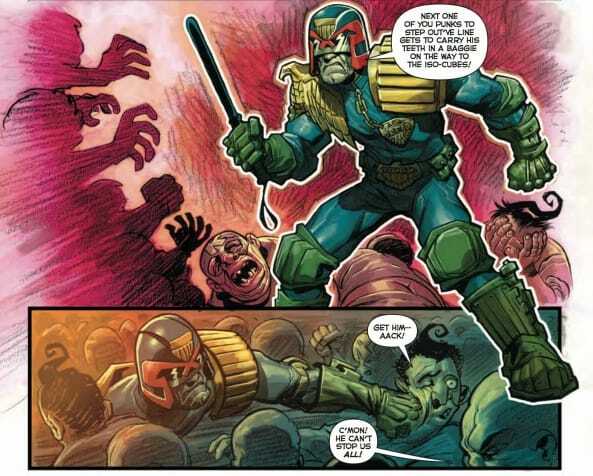 Can Dredd put a stop to the rebel's rampage or are some secrets simply too big to keep? One-shot, with art by Leigh Gallagher, colours by Chris Blythe and letters by Annie Parkhouse, in 2000 AD #1911, December 2014. Supercool jewel thief Danni Pond boards a bus full of trouble as he flees the scene of his latest crime with Judge Dredd on his tail. One-shot, with art by Carl Critchlow and letters by Annie Parkhouse, in 2000 AD #1923, March 2015. 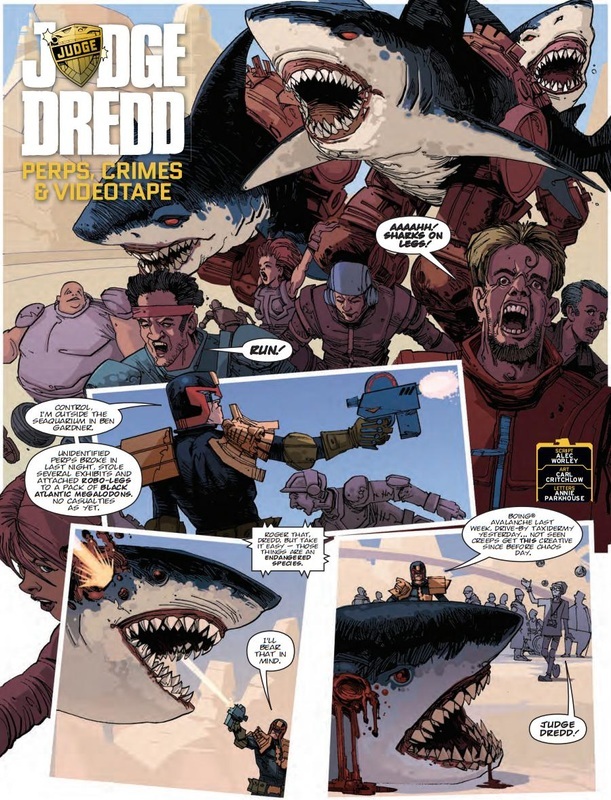 A wave of bizarre crimes has hit Mega-City One, culminating in all manner of watery hell breaking loose at the Jason Mamoa SeaQuarium. Judge Dredd must prevent visitors from becoming fishbait as he fends off the attentions of documentary filmmaker and self-styled 'crime critic' Orson Bunkheimer, who believes the city is seeing a renaissance in crackpot crime. One-shot, with art by Karl Richardson and letters by Annie Parkhouse, in 2000 AD #1957, November 2015. When calamity strikes the Mega-City Marathon, Dredd is forced to dig deep, go hard and work those glutes before death beats him to the finish line! "Worley's script is really fun and evokes memories of classic Judge Dredd." One-shot, with art by Eric Powell and letters by Sam Gretton, in the Free Comic Book Day 2016 edition of 2000 AD. Breck Horsepower and Charlie Zamm were once Mega-City One's hottest showbiz couple, now they're starring in rival superhero movies. As embittered fans clash at the guys' premiere, Judge Dredd instigates an unlikely reunion. Two episodes, with art by Karl Richardson and letters by Annie Parkhouse, in 2000 AD #2079-80, May 2018. 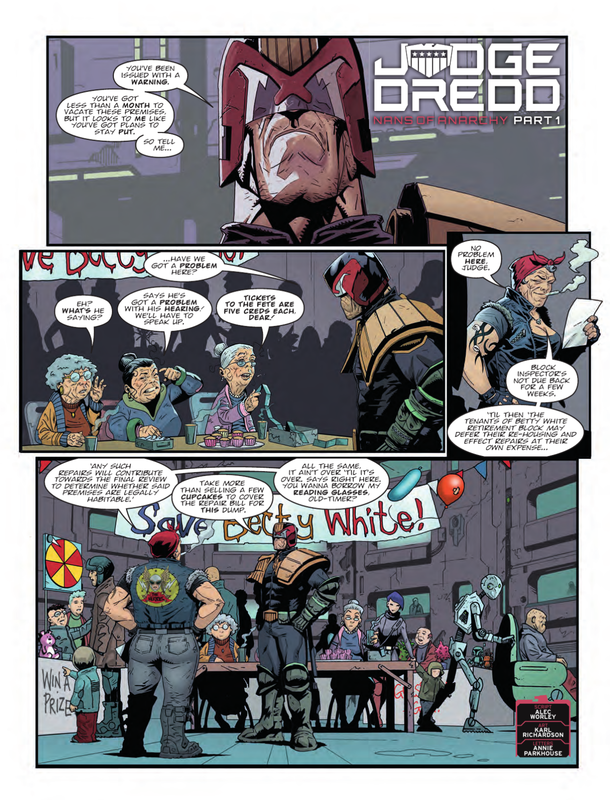 ​Dredd arrives to remind the ageing residents of Betty White Block that they stand on the brink of eviction, but not if retired biker 'Crazy' Daisy Magonnagall has anything to say about it. "Alec Worley's Dredd one-shots are excellent. If you're in the business of submitting Future Shocks to 2000 AD, or interested in writing comics, or just a plain ol' nerd about the form like myself, then these one-shots are a damn clinic in telling a fun story in a handful of pages."